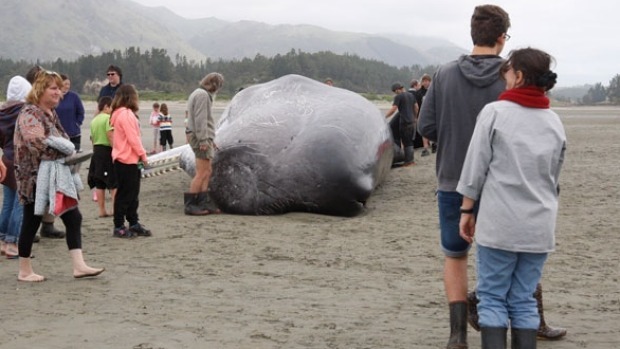 In what became a Golden Bay, New Zealand community event, hundreds of people turned up at Rototai beach (48.829S by 172.828E) to see and touch three dead sperm whales that had become stranded on Saturday night, November 22, 2014. The whales, which ranged in length from 14 to 17 meters long were located about one km out on tidal flats. The three whales were towed by tug boat to Farewell Spit last night, once the tide was high enough to move them. Department of Conservation biodiversity programme manager Hans Stoffregen said DOC had received a phone call from Rototai residents saying there were whales milling about at sea. "This morning we got a call from residents saying they were stranded." The quake that caused this event occurred on October 5th at 8:24 pm Wellington time. 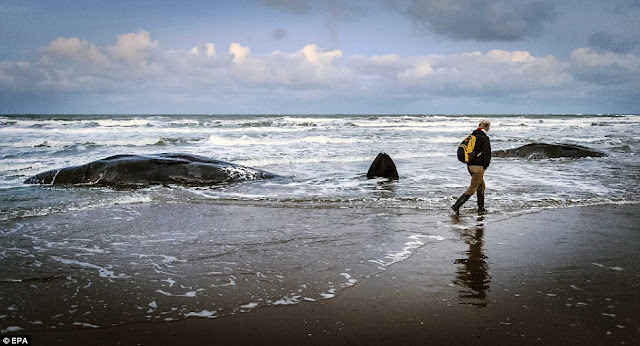 The stranding occurred 48 days after their injury, which explains why they died so quickly after stranding. I suspect they became trapped inside a current eddie for a few weeks. There were probably more whales in the pod that did not make the long journey. The time of the quakes was a prime feeding period for sperm whales. It was a strike/slip event that erupted only one kilometer below the seafloor. Shallow events such as this can be extremely dangerous for diving whales since far more seismic energy enters the hydrospace, than does so during deeper events. Badan Meteorologi dan Geofisika, Jakarta, Indonesia, listed this quake at 6.1 magnitude. Geoscience Australia, Canberra, ACT, Australia. listed the event as 6 magnitude. From the point of injury, the sperm whales (likely 5-6 members of a original pod) swam with the flow of the surface current as depicted in the chart below. The quake was located in the lower left side of the chart. The stranding site on the right side in the middle of the chart. As you can see, their swim path from injury to beach supports the idea that the quake had disabled their biosonar. "We have to report the arrival of the London ship, Black Swan, Capt. King, after a protracted passage of 107 days from Plymouth. Her passage list comprises 12 in the saloon, 9 in the second cabin, and 83 in the steerage ; and Capt. King is accompanied by his lady and child. He reports one of the most adverse passages he has ever known. The most noticeable circumstance on the voyage was the occurrence of an earthquake, which was most distinctly felt on board. 'It occurred on Friday the 23rd of May 1862, the ship being at that time in lat. 48.59 South. and long. 127.08 East. For several days the barometer had been very low, varying from 23 to 30, and early on the morning of the 23rd ult., the ship shook violently, and a peculiar sound was heard, as if the vessel were grating over the bottom, the tremor and the sound being so distinct, as to wake the watch below. Previous to her arrival, the passengers, the majority of whom are from Scotland, presented the officers of the ship and the surgeon with a complimentary address." She reached Port Chalmers between 6 and 7 p.m., and the passengers may be expected in town in the morning.